Blue Origin's reusable New Shepard rocket is seen after its successful landing during an unmanned test flight to suborbital space on Nov. 23, 2015. The Holy Grail of rocketry looks more and more achievable. 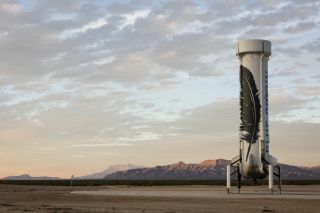 Last Monday (Nov. 23), the private spaceflight company Blue Origin sent a rocket to suborbital space and brought it back down for a controlled touchdown in West Texas. And earlier this year, competing private spaceflight company SpaceX twice nearly succeeded in soft-landing the first stage of its Falcon 9 rocket on an uncrewed ship in the Atlantic Ocean during orbital launches. "It's pushing the boundaries, which we were previously told could not happen," Eric Stallmer, president of the Commercial Spaceflight Federation, told Space.com. "I think what these two companies are doing is showing that it is possible, that it will reduce the cost." The billionaire founders of Blue Origin and SpaceX — Jeff Bezos and Elon Musk, respectively — have both stressed that reusable launch systems will be critical to humanity's quest to extend its footprint out into the solar system. "The reason that space travel is so expensive is because we throw this expensive, aerospace-grade rocketry away after each and every use, and so the Holy Grail of rocketry to make it less expensive is full reusability," Bezos said during a press briefing last Tuesday (Nov. 24). "That's really the key to getting millions of people living and working in space, exploring the solar system, going to Mars, going to everywhere else," he added. "We need to dramatically lower that cost." The difference made by reusable rockets should indeed be dramatic, Musk said. He has said that such launch systems could eventually reduce the cost of spaceflight by a factor of 100, making it economically feasible to create a sustained Mars colony, the ultimate goal Musk had in mind when he set up SpaceX in 2002. So SpaceX has been working on reusable-rocket tech for a while now. The company's Grasshopper rocket prototype landed successfully numerous times during test flights over the past few years, though it never came close to reaching space. SpaceX has also attempted to bring the first stage of its Falcon 9 rocket back to Earth for controlled landings during multiple orbital launches. The company has pulled off "ocean landings" in the Atlantic, dropping the booster stage softly into the waves. And SpaceX very nearly brought the rocket back for a soft touchdown on an uncrewed ship in January and April of last year. This happened during launches of SpaceX's Dragon capsule to the International Space Station on uncrewed re-supply runs for NASA. Both times, the Falcon 9 first stage succeeded in hitting its target. But the stage also came in a little too hard both times, toppling over on the boat's deck and exploding. Musk and other SpaceX representatives have vowed to keep trying until they pull off this daring feat, and Stallmer said he thinks the breakthrough will come soon. "I'd be surprised if the third time is not the charm for SpaceX," he said. When fully reusable systems do come online, they will usher in a new golden age of rocketry, Bezos said. It would be the first one since the 1960s, when NASA's giant Saturn V booster blasted Apollo astronauts to the moon, he added. Indeed, the lower cost and increased efficiency of reusable rockets will have far-reaching impacts in many different fields, Stallmer said. "The innovation and ingenuity of this new generation of space-launch companies are really going to change how we do business in space," he said. "Reducing the cost of access to space is going to open up so many new frontiers and really endless possibilities," he added. "I don't even know where the next big idea will come from, but that's the beauty of it."